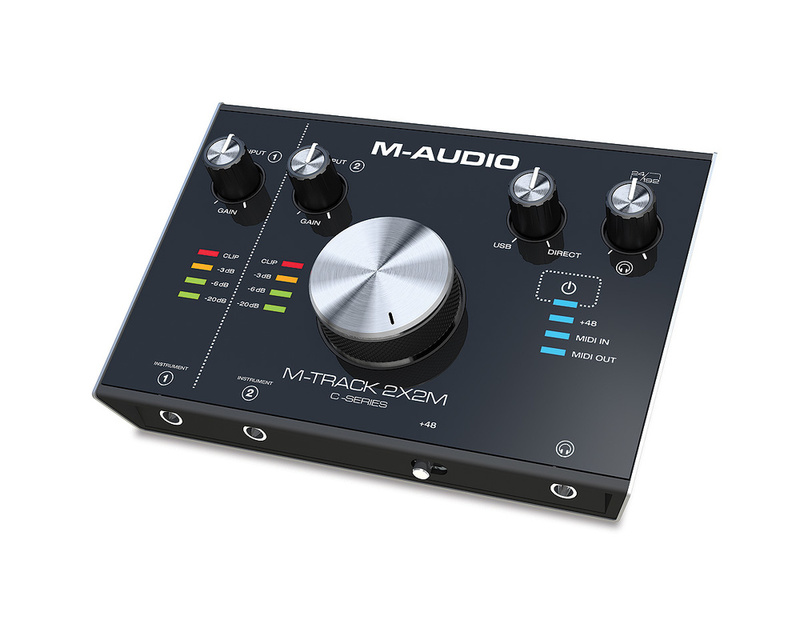 The M-Track 2X2M and 2X2 are the latest additions to M-Audio’s extensive array of audio interfaces, both featuring an ergonomic desktop ‘monitor controller’ form factor. Notably, both interfaces utilise the up-and-coming USB Type-C connector. Whilst the inclusion of USB-C is likely to be attractive to those who own recent, ultra-portable notebook computers, a USB-C to USB-A cable is provided in the box for anybody yet to jump on that particular bandwagon. We’ll look at the differences between the two as we go along, but essentially the 2X2 is a cut-down version of the 2X2M, lacking its extra input sockets and MIDI I/O. This is reflected in their relative prices. Out of the box, a highly attractive metal case is revealed. The top panel is covered in clear acrylic for a glass effect and the overall finish suggests real quality. A large main volume knob acts as a centrepiece and, curiously, all the other dials seem somewhat oversized too. Whilst this would perhaps not be to everyone’s taste, the controls are all solid to the touch, with no chance of them being knocked out of place during a recording session. To the left-hand side of the panel, below each gain control, is a four-stage LED meter to indicate input level. To the right there is a direct-monitor balance control and a headphone level knob. Blue LED lighting indicates power and phantom power status and, on the 2X2M, MIDI in/out activity. The front panel houses instrument jack inputs (two on the 2X2M and one on the 2X2), a phantom power toggle switch and a headphone socket. Conveniently, the instrument inputs on the 2X2M take precedence over the mic/line sockets on the rear, allowing users to leave microphones plugged in around the back when instruments are plugged into the front. The rear panel also includes balanced line outputs on quarter-inch jacks, MIDI sockets (on the 2X2M), a USB-C connector and a slot for a Kensington security lock. Getting set up is relatively straightforward, particularly on Mac OS where no driver software is required. Windows drivers are available from the support section of M-Audio’s web site and there’s no additional configuration software to install since operation relies on simple, hardware controls on the interface. Bundled software is abundant and may be downloaded and authenticated following registration. This bundle includes Cubase LE and a whole host of audio and virtual instrument plug-ins from AIR Music Technology that will be well known to users of Pro Tools. Those who really value their hard disk space should be warned that the Cubase installer includes additional content that will lay unused unless you either pay to upgrade or carry out detective work to remove the files manually; I’m perpetually frustrated by software manufacturers adopting this approach. Meanwhile, the bundled AIR software will helpfully complement any of the more modest DAW packages by adding audio processing functionality and high-quality sounds from the likes of Xpand!, the Mini Grand piano plug-in and the Strike drum plug-in. Once again, plenty of disk space is necessary, with Strike alone requiring some 56GB. The 2X2M from the rear: Two combination XLR/jack connectors are provided, as well as balanced line-output jacks. MIDI I/O is a helpful inclusion for those grappling with limited USB ports. Connection to the computer is via a newfangled USB-C socket. Put to work, the interfaces are incredibly simple to operate. Once microphones are plugged in, the LED meters provide a helpful indication of levels without having to glance back at the DAW software, although another couple of LEDs on the meter ladder would have made this even better. The preamps, although very simple, give plenty of gain with very little unwanted noise even at extreme settings. The mix control for input monitoring (playback versus input signals) makes it very quick to set up a monitor feed for the headphones, yet I would have preferred to have a button to toggle the input monitoring to ‘stereo’ mode — ie. input 1 panned to the left ear and input 2 to the right — as it makes it far easier for musicians to make a distinction between the two inputs. On the subject of buttons, it would have also been nice for the manufacturer to have included a few monitor controller facilities on the top panel — eg. mono and mute buttons under the volume knob — but at the price this is perhaps wishful thinking on my part. 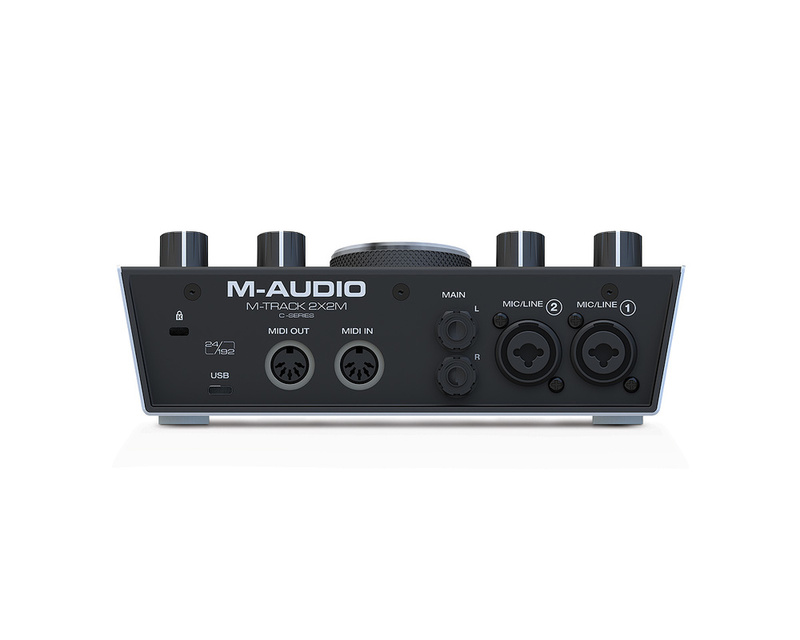 (Nevertheless, there is certainly some mileage in M-Audio releasing a slightly more expensive ‘pro’ model further down the line that may feature some of these buttons, a second headphone preamp and so on. I’d buy it!). The 2X2 variant also has two preamps, but these are confined to a single mic/line input and one instrument input. When using the 2X2M on projects with virtual instruments I was able to trigger and play back instruments at the lowest buffer size of 32 samples with no unwanted glitches or interruptions to the audio stream; very encouraging indeed considering my ageing computer. However, on a loop-back test to verify that the interface was reporting the correct latency figures to the software, I found there to be an additional 160 samples of latency (some 3.6ms at a 44.1kHz sample rate) that wasn’t being reported to the DAW. I found the 32-sample buffer size — with a total output latency of 6.4ms — to be very responsive, with negligible latency when playing on the keyboard. However, such unreported latency might prove more of a problem to users whose very hectic arrangements or intensive plug-in processing might force them to work at larger buffer sizes. Finally, D-A conversion is pleasing for the price. Listening to some of my go-to reference CDs on headphones I could hear definite advantages when compared to the on-board sound of my MacBook Pro playing at a similar volume. The M-Tracks revealed clear transients on snares and toms plus a slightly richer low-frequency response. With so many two-input audio interfaces at this end of the market it’s often very difficult to perceive any differences between them, so this came as a pleasant surprise. 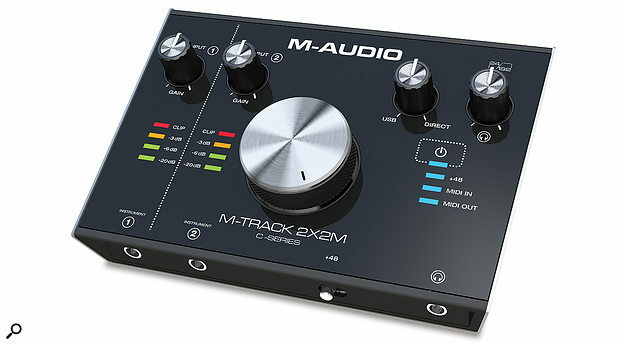 The two M-Track 2X2s exhibit a style, build and sound quality that sets them ahead of most of the competition in the ever-crowded market of compact audio interfaces. Putting aside quibbles with unreported latency, at the time of writing you’d need to spend a fair bit more to find an audio interface with similar specifications that would out-perform the 2X2s. At the price, I’d give the 2X2M model a firm recommendation: the slightly higher spend offers a wise investment in regard to dual microphone inputs and MIDI in/out, negating the need to upgrade early on or faff around with a USB hub! The Audient iD4, although slightly more expensive, features a wonderful (single) mic preamp, plus instrument input. Sublime quality of capture could be all yours for a little more money than the M-Audio 2X2M. Check out the SOS review of its bigger brother, the iD14, which uses the same preamps and converters, here: www.soundonsound.com/reviews/audient-id14. The Tascam US2x2 shares a similar feature set and price with the M-Track 2X2M. Its sample rate only extends to 96kHz, but it is iOS compatible and has slightly nicer sounding preamps (to my ears). Further information on the US2x2 can be found in this review: www.soundonsound.com/reviews/tascam-us20x20. USB 2, bus-powered using a USB-C connector. Requires Mac OS 10.8 or later; Windows 7 or later. Two simultaneous inputs, featuring two ‘combi’ mic/line inputs and two instrument inputs. Two balanced TRS line outputs. Supplied with two USB cables (USB-A to USB-C; USB-C), Cubase LE and AIR plug-in bundle (Creative FX Collection; Xpand! ; Strike; Mini Grand). Two simultaneous inputs (one ‘combi’ mic/line input, one instrument input). Ergonomic desktop case with solid construction. USB-C for simple interconnection with the most recent notebook computers. Unreported latency might present a problem for some users. A mono/stereo input monitoring function and a few monitor controller buttons would have been welcome. Stylish and easy to use, the M-Track 2X2 interfaces represent great value for money. Go for the 2X2M for an additional mic input and MIDI I/O. 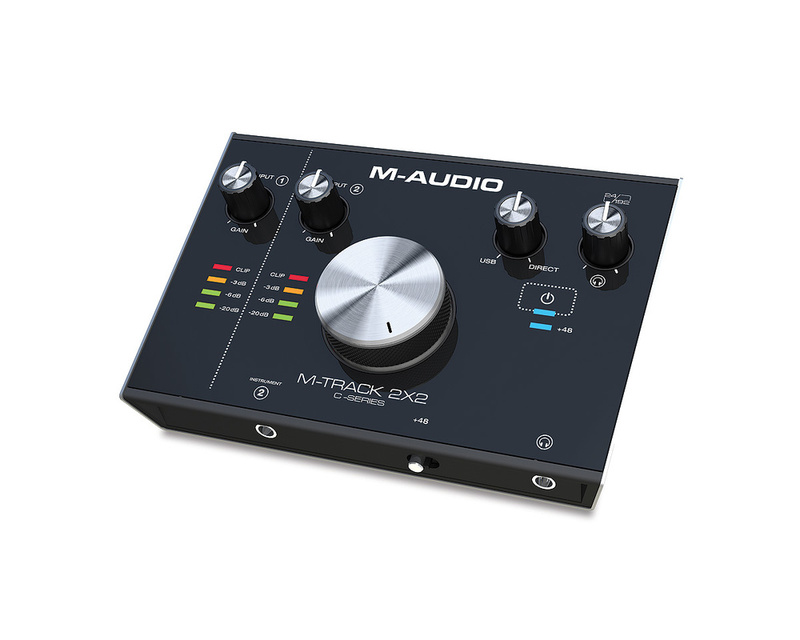 M-Track 2X2 £79.99, M-Track 2X2M £99.99. Prices include VAT. 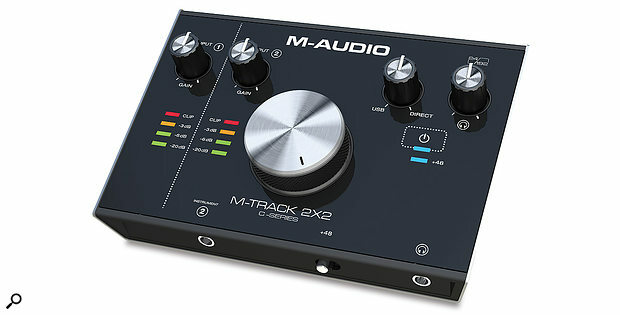 M-Track 2X2 $99, M-Track 2X2M $149.